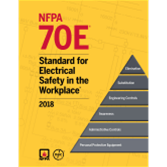 Keep the workplace safe from electrical hazards using the 2018 edition of NFPA 70E®. In a fraction of a second, an electrical incident can claim lives and cause permanently disabling injuries. In fact, hundreds of deaths and thousands of burn injuries occur each year due to shock, electrocution, arc flash, and arc blast -- and most could be prevented through compliance with NFPA 70E, Standard for Electrical Safety in the Workplace®. Originally developed at OSHA's request, NFPA 70E responds to the latest information about the effects of arc flash, arc blast, and direct current (dc) hazards, and recent developments in electrical design and Personal Protective Equipment (PPE). It provides vital information that helps you comply with OSHA 1910 Subpart S and OSHA 1926 Subpart K.
Make sure everyone goes home at night. New NFPA 70E explicitly states that the first priority must be the elimination of the hazard. The Standard continues to evolve to address risk assessment and introduces human factors, such as human error, as part of that assessment. Annex Q, Human Performance and Workplace Electrical Safety, is included to provide guidance. NFPA 70E emphasizes the need to use the hierarchy of risk controls, by moving it from an informational note into the text of the Standard. NFPA 70E now explicitly states that the first priority must be the elimination of the hazard. A modified arc flash hazard identification table [Table 130.7(C)(15)(A)(a)] makes it easier to determine the likelihood that an arc flash could occur. Reorganized Article 120 presents the requirements for establishing an electrically safe work condition in a logical order of application of the program. Changes to Article 320 introduce voltage thresholds of 100 Vdc specifically for batteries and battery rooms to cover the unique situations in these locations. Extensively revised, Article 330 on lasers now focuses on safety-related maintenance issues rather than issues associated with laser use. Article 350 introduces an Electrical Safety Authority as a possible authority having jurisdiction for laboratories. Bring your company's electrical safety program up-to-date and give employees critical knowledge. Interested in other editions of NFPA 70E? Use the drop down menu above to select the edition year you need. NFPA 70E®: Standard for Electrical Safety in the Workplace® reduces the risk of death or injury due to electrical hazards. Used correctly, the safe work practices in NFPA 70E can stop workplace electrical accidents before they happen by reducing exposure to major electrical hazards. Originally developed at OSHA's request, NFPA 70E helps companies and employees avoid workplace injuries and fatalities due to shock, electrocution, arc flash, and arc blast, and assists in complying with OSHA 1910 Subpart S and OSHA 1926 Subpart K. Each edition of NFPA 70E builds on the next, incorporating the latest research and "lessons learned" from the field. The 2015 edition NFPA 70E: Electrical Safety in the Workplace introduces a major change in how stakeholders evaluate electrical risk -- so that owners, managers, and employees can work together to ensure an electrically safe working area and comply with OSHA 1910 Subpart S and OSHA 1926 Subpart K.
The 2012 edition of NFPA 70E is updated to help users reduce the risk of electrical injuries and fatalities on the job. Revised rules and Annex F clearly differentiate between "risk assessment" and "hazard identification." Added text explains when the energized work permit (EWP) is required and what it should contain. This edition also includes a new shock protection boundary, hazard/risk table, and incident energy calculation for direct current systems. Revised Article 320 focuses on safe work practices for stationary batteries and battery rooms, such as those used by alternative energy systems. The 2009 NFPA 70E introduces an easier way to calculate incident energy -- the first step in determining PPE -- with revised Annex D that consolidates equations, adds tables, and provides alternatives to making detailed calculations. Other changes in this edition recognize a broader array of hazards and help reduce safety gaps. To further reduce the risks for second-degree thermal burns, cotton outerwear is no longer permitted for energy levels below 2 cal/cm2. An expanded Table in Article 130 covers added tasks such as thermographic imaging, and new equipment including arc-resistant switchgear. New Article 350 offers the Standard's first requirements for the protection of electrical personnel in R&D labs. New recordkeeping requirements for training and safety program audits respond to OSHA's need for records. The 2004 NFPA 70E improves compatibility with the NFPA 70®: National Electrical Code® (NEC®) with a new format featuring corresponding provisions. Installation criteria correlate with the 2002 NEC. To reduce the potential for errors, Safety Related Work Practices are prioritized to provide more specific safety guidance, and revised PPE requirements help minimize unsafe exposures. A new provision for a signed authorization for energized electrical work further reduces the likelihood of electrical accidents. New language concerning multi-employer relationships requires all contractors on a project to be aware of hazards, PPE, safe work practices, and emergency evacuation procedures. Definitions clarify electrical safety issues such as arc rating, incident energy, and restricted approach boundary. Interested in other editions of the NFPA 70E? Use the drop down menu above to select the edition year you need. NFPA® now makes available PDF versions of forms originally published in our NFPA Standards and handbooks. These eForms allow you to fill in the form fields electronically and then save, print, or share the file. NFPA eForms are intended for use on computers and are compatible with some mobile devices and apps. An internet connection is not needed to fill in and save the forms once they are downloaded to your device. NFPA eForms can be used with many PDF applications. Functions of the specific PDF application will work on the forms. For example, most PDF applications include a signature feature, allowing you to use your finger, stylus, or mouse to sign a document. Note that NFPA eForms are not compatible with the NFPA eLibrary app. Directions on how to use on a desktop or mobile device are provided on the first page of the PDF.